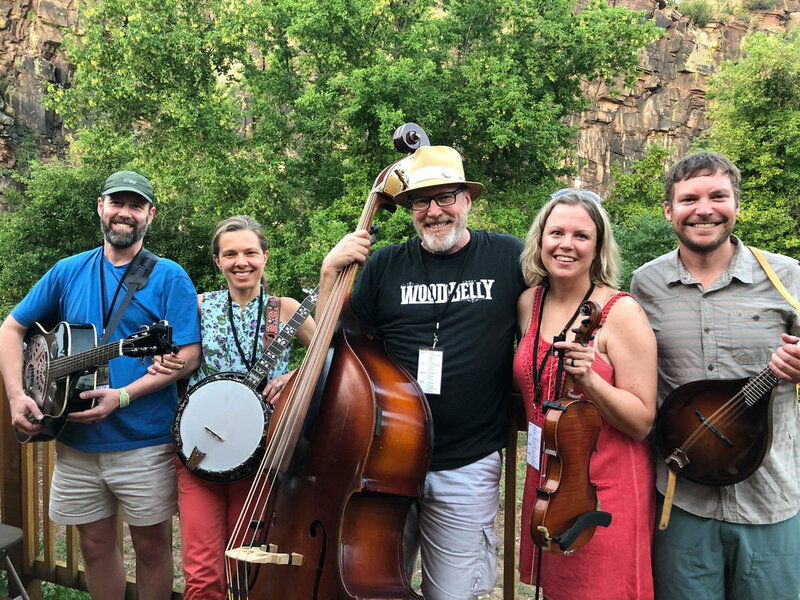 This past summer, 2018, was my first year to attend RockyGrass Academy [RGA] and I have to say, I’m hooked! Even with questionable weather all week, the Academy experience is to live, eat and breathe music for five days in one of the most beautiful places on earth. It did rain and sometimes pour on us three to four times per day, but everyone at RGA took it with good humor. It was just another small piece of the experience to take away as a lifetime memory. My days started early; I would get up around 7:00 a.m. and take a shower, get some coffee and maybe a breakfast burrito. Those willing could participate in morning yoga on the massive field, which would become the seating area for the festival the following weekend. People milled around the registration area to check the announcement boards in anticipation of the day to come. Author John Pierce [center] with his “band scramble” group from Rocky Grass Academy 2018. Students could sign up for one-on-ones with the all-star instructors at 8:30 each morning or alternatively could attend one of the morning concert/Q&A sessions in the Wildflower Pavilion. Want to attend a small venue concert with the Grant Gordy Band or Hot Rize or the Artistworks All Stars? This is the ticket! Front row seat to see your heroes? Easily done. Later in the morning, I attended song sessions where we broke out into groups of five to eight players all across the meadow next to the St. Vrain for an hour and a half of jamming. The instructors would come by each group and “tune us up” with our timing, harmonies, kicks and breaks. First cool “moment” of the week: Becky Buller came by, and in 10 minutes took our 3-part harmony from “acceptable” to sounding awesome! Second cool moment of the week: standing next to Sierra Hull, playing bass and singing, while she chopped her mandolin before taking a killer break and giving us all suggestions on how to improve our musicality. Not bad, not bad at all. Attendees at RockyGrass Academy 2017 participate in a “band scramble” performance. After lunch, we broke out into our novice/intermediate/advanced instrument groups with an instructor and worked on technique, tone, timing, walking lines, etc. I was in the bass track and therefore my instructors were Missy Raines, Aidan O’Donnell and Todd Phillips. It's a humbling experience to get personal instruction from your musical heroes! At 4:00 p.m. each day, we had at least 15 different “electives” to choose from, presented by our instructors. One day, I chose “Intro to Slapping the Bass”, the next day, “Pickups and Stage Amplification for Bass”, and finally, the “Bluegrass Retrospective” session with Bryan Sutton. Did you know he’s totally a bluegrass history nerd? Michael Daves sat in on most of that session because he’s a giant history nerd too. I love that! The session was supposed to last an hour, but ended up going almost two hours with the traditional massive downpour of rain right in the middle of the session. Bryan cued up and played dozens of different tunes from around mid-1925 to the current day giving on-the-spot examples of the evolution of guitar licks in bluegrass music. Third “moment” of the week: at the end of the Retrospective session Bryan says, “Well, I guess we should play something, Michael.” Then he looks at me, “What do you want to hear?” I requested to hear “I’m Coming Back, But I Don’t Know When,” which I know Bryan and Michael have performed as a duet, and they proceeded to blow me away with their harmonies and incendiary picking three feet from where I was sitting! It was totally worth the price of the entire week just for this special moment. Thanks Bryan and Michael! A 2am jam in the on-site camping area at Rocky Grass. The infamous Coleman Square camp hosts happy hour every day after classes and it proved to be the “place to be” for the first hot jams of the evening. There was always something great going on there! After dinner, jamming in the on-site campground would commence and probably went until 1:00 or 2:00 a.m. every morning. I’d get about 4-5 hours of sleep, wake up and do it again! As with many music camps, RGA has a band scramble. Students write down their names, instruments and whether they sing on a small slip of paper. These are divided into different piles by instrument and a “band” is created by randomly selecting one of each instrument. My group, The No Frets, was comprised of four other students I had never met: Jesse Weiss, Elizabeth Weiss, Megan Leesley and Jamey Turner. They were a great group of folks, and I am happy to have them as new musical friends. We didn’t make it to the finals, but we had a great time. The audience for band scramble consists of the other students in RGA, which means you couldn’t find a more receptive and supportive audience. One of the groups performed a grassy version of “Eye Of The Tiger,” and well, you just had to be there! Instrument Building class instructor Bobby Wintringham assisting a student. The instrument building group had a “show and tell” of all their completed instruments on Thursday afternoon which turned into a mini-concert with Molly Tuttle, Bryan Sutton, Don Julin, Darol Anger, Michael Daves, Sierra Hull and John Reischman. They played the frets off those new instruments, sending their owners away beaming with pride! The RGA week came to an end all too soon culminating with a gathering of all the students around and in the St. Vrain River to sing gospel songs. A magical moment, to be sure. RockyGrass Academy was at an end, but the festival was just starting. The land rush for on-site camping had completed while we were all eating dinner at the Thursday night Academy barbecue. Our small musical community of students and instructors had swollen to many times its original size with festivarians ready for a packed calendar going into the weekend. I lived in anticipation of this week for almost a year, and now I find myself looking at the calendar and counting the days until the 2019 RGA. Five days and a lifetime of memories. Attendees at the 2017 RockyGrass Academy singing gospel in the St. Vrain river at the culmination of the Academy.